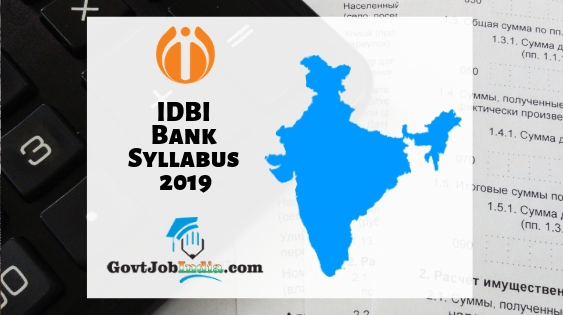 IDBI Assistant Manager Syllabus 2019 PDF – Since the Industrial Development Bank of India is conducting the IDBI Exam 2019, candidates will require the IDBI Assistant Manager Syllabus for the preparation. In this article, we have given the IDBI Assistant Manager Exam Pattern 2019 which will give you the specific weightage and marks allotted to each subject in the examination. Also, you will get a general idea of how and when you need to prepare for the IDBI Bank Assistant Manager Recruitment 2019. Furthermore, we have also given the IDBI Assistant Manager Syllabus PDF for Download which will enable you to save this file onto your personal computer or laptop and read it whenever you are free. This will give you good leverage over the preparation for the IDBI AM Recruitment exam 2019 and let you prepare even when you are offline. The official website from where we borrowed this information from is www.idbi.com. The official IDBI Assistant Manager Notification PDF came out and the syllabus and exam scheme of the examination was given in the same. You can cross check the information given on our page with the one given in the authorized file. The IDBI Assistant Manager Vacancy 2019 was a splendid chance for the candidates across the country for securing a bank job in the country. We advise you to not waste this opportunity and start preparing for the recruitment exam as soon as possible. So, now that you have gone through the introduction, let us move onto the detailed article. Candidates who are looking for the syllabus of the IDBI Assistant Manager Recruitment can find it here in the following sections. We have also attached the PDF of the recruitment syllabus which will enable you to go through the syllabus even when you are offline. All you have to do is click on the link and you will be taken to the Google Drive folder where you will get access to this file. You can download it from there. Answer Key IDBI Bank Assistant Manager Answer Key: Know your score! Did you find the information provided about the IDBI Bank Assistant Manager Syllabus PDF 2019 enough? Did you find the extent to which we have covered the subjects? If you think this article was helpful in all terms, share this page with all those who might require this page. In case you further have any doubts about the IDBI Assistant Manager Syllabus 2019, comment it below and we will get back to you as soon as possible. Furthermore, leave all your suggestions and requirements in the comment section provided below. This will help us improve our site which in turn will give you a better experience here. To sum up, our GovtJobIndia.com Team is requesting you to subscribe to our website @ GovtJobIndia.com for latest updates about the upcoming job openings spanning the nation.